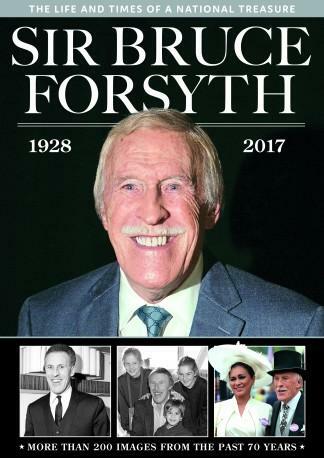 A celebrity without equal, Sir Bruce Forsyth graced stage and screen for more than 75 years. From his early days treading the boards to his star-studded appearances on long-running BBC TV series Strictly Come Dancing, Bruce enchanted audiences with his unique style and carved a successful career in show business which saw him elevated to entertainment icon without parallel. This colourful, picture-packed publication pays tribute to the man, the celebrity, the star, whose quick wit and ready ripostes delighted audiences of all ages. There are photographs of Sir Bruce rubbing shoulders with actors, royalty and sporting giants, doing the things he loved – dancing, playing golf, relaxing with his family – and most importantly of all, making those around him happy, whether they were audiences in their thousands or an intimate gathering of friends and relatives. In summary, Sir Bruce has left a legacy of love and laughter – an act that will truly be hard to follow. Be the first person to tell us what you think about Sir Bruce Forsyth and you'll save £2.50 on your next purchase!